Atlantic Center for The Arts Harris House Gallery in New Smyrna Beach, Fl. Here you will find creative art and wellness workshops that you can attend with no experience necessary! As a 20 year teaching artist with a masters degree in art therapy, Laura Bohn combines arts and wellness in workshops and classes. ​Learning to express our own stories through the arts is innately healing. 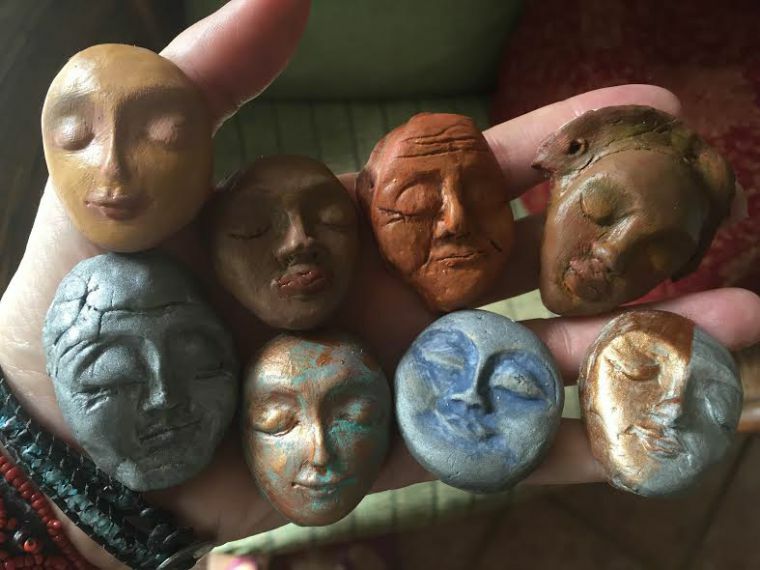 These workshops focus on mindfulness in creating in the moment for joy, and self expression. Making room for a expressive arts practice in your life is the goal here. 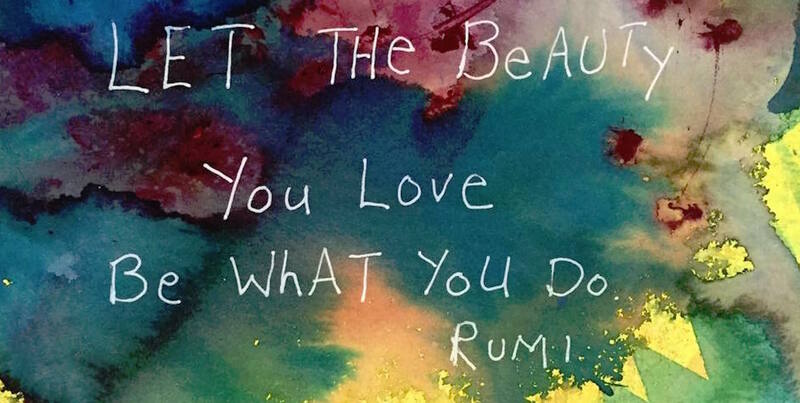 Whether you paint, write, dance, or sing, combining art and wellness can give your life authentic expression. Authentic creative expression is a way to tell your story. We try to have fun because through laughter blooms the soul! at Harris House Gallery in New Smyrna Beach, Fl. 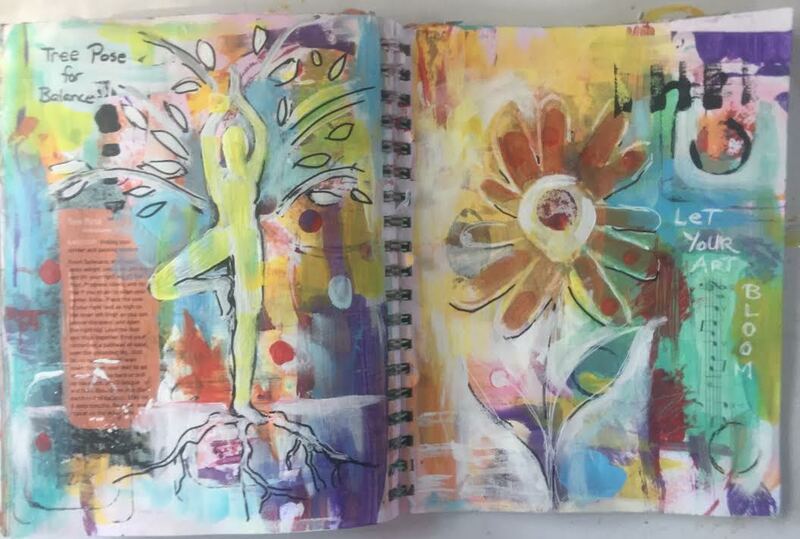 Come play and explore by bringing a journal size used book to transform into a personal expressive art journal! 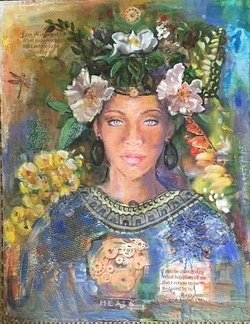 Transformational Painted Collage Portraits for Creative Self Discovery and Stress Release on August 27th! Check out my blog page on more details about self discovery through this process. Thursday July 28th at Casa Montessori School in DeLand, Fl. and includes use of basic supplies including paint,glue, color pencils, stencils, some collage materials, brushes, etc. (journal not included). To have a more personally expressive experience, please bring old greeting cards, printed images, fabric scraps, photocopied pictures, or whatever you would like to add to your journal. I will also have tools available to help you establish a theme or you may simply play with materials and build your pages in stages. ​ to register and I will send you details and how to pay. Learn how to use relaxation techniques, painting, and movement as a wellness practice. Discover how to let go and enjoy colors, symbols, and physical movement in painting. We will take a lunch break so please bring a lunch and drink or you may order from a near by restaurant. Refrigeration available. Supply fee $20 due at time of registration. I have been partnering with Atlantic Center for the Arts (ACA) to bring free or low cost arts and wellness programming to the community. 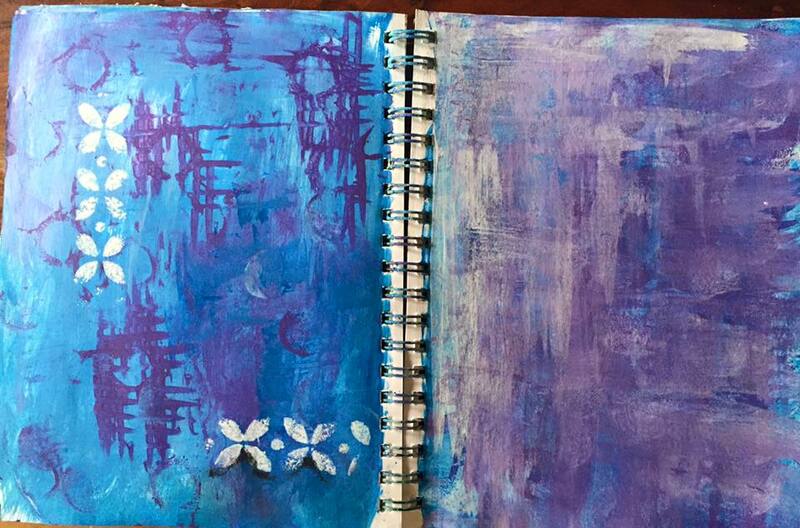 So far I have facilitated intuitive painting and movement classes and expressive art journaling workshops. Through the ACA I have trained with Gary Glazner and the creative care guide with the National Center for Creative Aging to bring relief to caregivers of those with Alzheimers and other cognitive disorders. Click below to check out new and upcoming workshops. with artist, educator, and Art Therapist, Laura Bohn. Every Saturday in April (2, 9, 16, 23, 30) 1 PM - 3:30 PM. ACA Downtown: Harris House, 214 S. Riverside Drive, NSB, FL. Come explore, create, and play in an intuitive way. This is a “no experience necessary” kind of workshop that will benefit anyone. so that you can play with paint, collage, words and other materials in a fun way that will help you tell your story and release daily stress! This workshop is part of ACA’s ongoing Arts & Wellness programming and is Free and open to the public. You can attend one or all. Recently I facilitated six intuitive painting workshops for the ACA Harris House. Photo from one of the recent intuitive painting workshops. The Harris House is a wonderful space for classes and workshops. 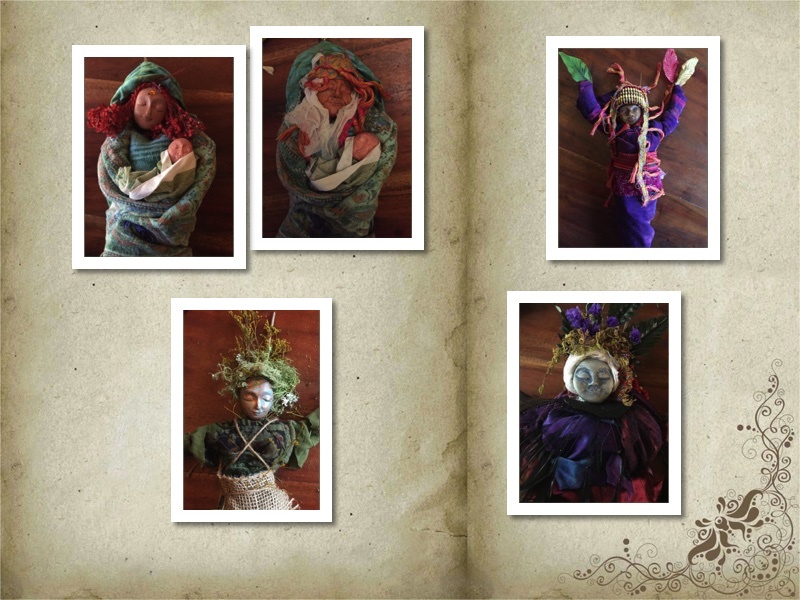 we will all create a spirit doll, wise woman, goddess, heroine, tree woman, moon goddess, mother nature, or any other character. Your story begins with the creation of this character. ​ Feel free to create up to two characters. By playing with materials, the process begins to build as you follow it. This workshop is inspired by Maureen Murdock's text The Heroine's Journey, Carl Jung's use of universal archetypes, as well as Dr. Clarissa Pinkole Estes' text Woman Who Run with Wolves. Materials are included but you are encouraged to bring old bits of jewelry, charms, fabric or natural materials you would like to use as it will make it more personal. ​The materials you are attracted to in the moment will speak to you and guide you through this process. This class is finished but stay tuned for future updates. If you would like to read more about this past workshop click the blog link below. Disclaimer:n Although therapeutic and the facilitator is an art therapist, this DOES NOT CONSTITUTE art therapy. Art therapy is a separate and distinct field of practice. The format, the structure, and frequency of the art and wellness workshops make it clear that the leaders are acting as facilitators of the creative process.